Post-infectious and inflammatory encephalomyelitis are broadly represented by the syndrome acute disseminated encephalomyelitis (ADEM). ADEM forms one of several categories of primary inflammatory demyelinating disorders of the central nervous system. Others include multiple sclerosis (MS), acute transverse myelitis, and Devic’s disease. It should be remembered that these are syndromically defined diseases at present. There are no diagnostic tests presently available short of brain biopsy, but future advances may reveal diagnostic biological markers of disease and in so doing dramatically advance the pathophysiological and therapeutic understanding of these conditions. A wholesale change in classification and nomenclature may well follow. In the meantime clinicians must remain keenly appreciative of subtle shades of grey: ADEM, first MS relapse, or ultimately benign clinically isolated syndrome? The answers are relevant to prognosis and, more recently, selection of the correct therapeutic strategy. ADEM is an inflammatory demyelinating disorder of the central nervous system that is usually monophasic, but a relapsing variant distinct from MS—multiphasic disseminated encephalomyelitis (MDEM) is well-described. ADEM is predominantly, though by no means exclusively, a disease of children and in particular infants. Historically it includes post-infectious encephalomyelitis and post-vaccination encephalomyelitis. While these two syndromes were distinguished by their precipitant it was realised that clinically and pathologically they were very similar. As there were also a significant proportion of cases in which no antecedent infectious or inflammatory event is identifiable historically, microbiologically, or serologically the term ADEM has become clinically useful. ADEM has a more severe and aggressive phenotype than acute events or relapses in MS; it is, however, less severe than the often fatal acute haemorrhagic leucoencephalomyelitis. ADEM (and MDEM) does not share the relentless progressive phase evident in MS, and providing the initial insult is withstood, ultimately has a better prognosis. Post-infectious encephalomyelitis is associated with an antecedent or concomitant infection, usually viral. Most notoriously, measles virus infection is followed by ADEM in approximately 1 in 1000 cases. Incidences of ADEM after varicella zoster and rubella virus infections are quoted as 1 in 10 000 and 1 in 20 000, respectively. Other infectious (or para-infectious) precipitants include mycoplasma (and other atypical pneumonic infections), herpes viruses, leptospira, and borrelia. A full list of recognised causes of ADEM is provided in table 1. Post-infectious encephalomyelitis is greatly reduced in incidence following the introduction of widespread measles vaccination, but still occurs. Non-specific or unidentified viral illnesses can also antecede ADEM, and this lack of a specific infectious agent should not preclude the diagnosis. There are some variations in the ADEM phenotype dependent upon the antecedent illness. Measles associated ADEM tends to produce a more clinically severe phenotype while cerebellar ataxia is closely associated with varicella (and carries an excellent prognosis, although whether this represents an infectious or a para-infectious process remains unresolved). A unique childhood ADEM phenotype was recently reported in association with group A β haemolytic streptococcal infection. Ten children between the ages of 3–14 years developed a clinically typical ADEM presentation but with prominent additional features of a dystonic extrapyramidal syndrome (70%) or behavioural disorder such as emotional lability or inappropriate speech (50%). The syndrome followed an acute pharyngitis but was distinct from rheumatic fever or Sydenham’s chorea and was associated with elevated antibasal ganglia antibodies. The historically described disorders which occurred following rabies vaccination and after measles virus infection essentially represent prototypic ADEM. “Neuroparalytic accidents” in patients receiving Jenner’s smallpox (actually cowpox) vaccine were noted after its more widespread introduction in 1853, and in patients receiving Pasteur’s rabies vaccine, introduced in 1885. It was not until the 1920s, however, that the disorder appeared to gain more formal and widespread recognition. Pasteur’s inoculum was prepared from rabbit spinal cord injected with fixed rabies virus and would cause a “neuroparalytic accident” (ADEM) in approximately 1 in 1000 people. Neuroparalytic accidents were initially thought to be caused by the vaccine’s viral component although later it was recognised that they could have resulted from the central nervous system (CNS) tissue contaminating the vaccine. This is supported by a much reduced incidence of post-vaccination encephalomyelitis, now that most vaccines are no longer prepared from in vivo infected CNS tissue, and the similarity with experimental allergic encephalomyelitis (EAE). EAE is induced by inoculating myelin or myelin antigens into a suitable experimental animal to produce a disease that clinically and pathologically closely resembles ADEM. Post-vaccination encephalomyelitis continues to be seen after rabies vaccine containing neural tissue, such as the Semple preparation (extracted from rabbit brain and used particularly in developing countries), and duck embryo vaccine, which also contains minimal amounts of neural tissue. The origin and cause of post-smallpox inoculation encephalomyelitis is less clear as vaccine preparation does not involve neural tissues. Since variola virus, the cause of smallpox that claimed 300 million lives in the 20th century, was eradicated in 1980 this was considered a wholly academic conundrum. However, a recent trend towards innovation in terrorism has led to concern that smallpox could return. Since 1980 the World Health Organization has permitted retention of the variola virus at two designated laboratories, one in the USA and the other in Russia, for the sole purpose of creating a safer vaccine than the presently available live vaccinia virus (which is closely related to the variola virus) used for the last two centuries. New vaccine is not expected until 2004. In the meantime bio-terrorism concerns have resulted in a smallpox vaccination programme starting in the USA. Both the USA and UK have enough vaccine to cover their entire populations. Previously reported incidences of post-vaccinal encephalomyelitis following use of this vaccine are of the order of 10–300 cases for every one million vaccinations. A conservative projection would mean approximately 600 cases of ADEM if the UK were to vaccinate its entire population. This complication can be dramatically attenuated by administration of anti-vaccinia γ globulin at the time of the vaccination. Presently, however, the non-neural measles, mumps, and rubella vaccinations are most commonly associated with post–vaccination encephalomyelitis. The incidence is 1-2 per million for live measles vaccinations. This is somewhat less than the 1 in 1000 incidence of post-infectious encephalomyelitis following measles virus infection. They may reasonably conclude that while both a cause and a prevention of ADEM, on balance vaccination dramatically reduces the incidence of ADEM. Post-vaccination encephalomyelitis would typically form less than 5% of present ADEM cases. ADEM is more common in children although it can occur at any age. In children there is a suggestion of a seasonal peak of cases in winter and spring, in keeping with a post-infectious aetiology. There appears to be a slight male preponderance in the paediatric population that is reversed in adults. Clinically evident antecedent infection occurs in about two thirds of children but less than half of adults. The timing of the first symptoms varies slightly with the precipitant: typically 1–14 days after non-neural vaccines, a week or less after the appearance of a rash in exanthematous illnesses, and 1–3 weeks (or more) after rabies inoculation. The focal presentation of ADEM is heterogeneous and dependent upon the location and degree of the inflammatory–demyelinating process within the CNS. Multifocal neurological deficits consisting of combinations of pyramidal and cerebellar signs are very common, as are cranial neuropathies, including bilateral optic neuritis, encountered more frequently in ADEM than MS (table 2). Isolated transverse myelitis is usually considered a separate, although related, entity to ADEM, but a myelitis, usually recognised by a paraparesis or quadriparesis and urinary dysfunction, forms part of an ADEM presentation in about a quarter of cases. The peripheral nervous system may be involved particularly in post-rabies vaccination disease, where a predilection for radicular complications is found. Of course, conventional Guillain-Barré syndrome can follow inoculations or infectious processes, and combined Guillain-Barré syndrome and ADEM after infections is also well described. Acute haemorrhagic leucoencephalomyelitis, or Weston-Hurst disease, is a rare, more severe (indeed commonly fatal) disorder than ADEM that probably represents a gradient of severity in the same disease. The course is more rapid, with pronounced systemic features; seizures are frequent and coma usual. Cerebrospinal fluid (CSF) analysis often reveals a raised intracranial pressure, and a pleomorphic cellular reaction with lymphocytes, neutrophils, and significant numbers of red cells, reflecting the micro-haemorrhagic process. Spontaneous recovery is the rule, usually over a course of weeks to months. ADEM tends to have a more severe initial course but much better ultimate recovery than MS. Historically fatal disease was common, with reported mortality rates as high as 30–50% as recently as 1948 in European children with post-vaccination ADEM. The outlook this millennium appears much brighter, with three recent studies encompassing 150 children with ADEM reporting no deaths. One of these studies followed up their 35 cases for a mean 5.8 years and found that the majority completely recovered in a few weeks. Twenty patients had no long term impairment; permanent neurological deficits included motor dysfunction (six patients, severe in three), cognitive impairment (four patients), visual loss (four patients), and behavioural problems (four patients). Epilepsy developed in three patients but persisted in only one with extended follow up. A recent study of 40 adult patients with ADEM reported two mortalities, suggesting that adult ADEM may presently have a slightly worse prognosis than childhood ADEM. In relatively rare cases, ADEM relapses. The terminology is evolving: previously, relapsing acute disseminated encephalomyelitis was used, and more recently bi-phasic disseminated encephalomyelitis has been proposed. The confusion is compounded by the lack of a strict definition for MDEM: different case series of MDEM may describe disparate clinicopathological entities (an inference supported by the very heterogeneous clinical results). Some suggest that MDEM represents steroid modulated ADEM, or an unusual form of MS, or true chance recurrence of ADEM in susceptible individuals—or possibly a combination of all three. The case for MDEM being a separate disease from MS is most obvious in children (table 3). In one important study of 48 children with acute disseminated demyelination of the CNS followed up for an average of 5.64 years, 28 were ultimately diagnosed with ADEM, seven with MDEM, and 13 with MS. The seven cases of MDEM relapsed within a few months of the initial episode and all relapses occurred no more than two months after stopping steroids, supporting the suggestion that MDEM may partially be an artefact of steroidal interference with ADEM’s natural history. Subsequent relapses were not seen during the follow up period. However, in another study of 84 children with ADEM and a mean follow up of 6.6 years, 90% had a monophasic disease course while 10% had a biphasic disease course: here, however, the second event occurred after a mean interval of 2.9 years. It would seem MDEM has a strong tendency to be bi-phasic in children. Obviously the longer term conversion rate to MS would be most instructive but is presently unknown. MDEM is less well documented in adults and generally its distinction from MS seems to be more subtle and perhaps more controversial than is the case in children (table 3). One study reported five adult patients, all with a clinical course and, significantly, cerebral biopsy that the authors felt was best explained by MDEM. The age range was 30–77 years. One patient had four episodes, two had three episodes, and two had two episodes each. None of these patients had any antecedent infection or vaccination. The first relapse occurred on average 13 months after the first episode. Of note, the clinical presentation at relapse involved, at least in part, the same CNS territory that was affected during the initial episode in six of nine relapses. Only one of these patients had oligoclonal bands. MDEM therefore appears to have a lower propensity to disseminate in both space and time compared to MS.
Another study of 40 adults with a diagnosis of ADEM found that after prolonged follow up 14 had developed clinically definite MS (Poser criteria) and considered none to have developed MDEM. Certainly, strict application of Poser or McDonald criteria is likely to leave little room for the diagnosis of adult MDEM. However, the MDEM epithet may find a useful role in adults if accepted as a form of MS in which the relapses are ADEM-like. MS is increasingly thought of as a neurodegenerative disease with superimposed adaptive—or maladaptive and pathogenetic—inflammation. If longer term follow up studies of MDEM conclusively confirm that it lacks both histopathological evidence of chronic and progressive neurodegeneration, and its clinical hallmark, secondary progressive disability, then its credibility as a distinct diagnosis from MS in adults will be greater. The diagnosis of ADEM (and MDEM) is commonly made from the typical clinical picture. No tests are pathognomic but the following can aid diagnosis. CSF examination usually reveals a lymphocytic pleocytosis and raised protein levels both greater than those typically found in MS. CSF oligoclonal band presence is less common in ADEM than in MS. In children with ADEM oligoclonal band frequency is reported in between 3–29% of cases while in adults with ADEM oligoclonal bands have been reported in 58%. Transient appearance of oligoclonal bands is not uncommon in ADEM (but vanishingly rare in MS). While it is possible to detect specific viral proteins from some of the viruses implicated as causes of ADEM in the CSF, the diagnostic value of this is uncertain. Computed tomography (CT) of the brain in ADEM can be normal but often shows non-specific, low attenuation subcortical white matter lesions that may or may not enhance. In cases of acute haemorrhagic encephalomyelitis CT scanning may reveal haemorrhage and oedema associated structural changes. Magnetic resonance imaging (MRI) is considered to be more useful. MRI at presentation can be normal and delays of between 5–14 days from symptom to MRI abnormality have been reported. Multifocal MRI lesions similar to those seen in MS are observed: the patterns overlap significantly, but diagnostically useful differences in their distribution have been described. ADEM lesions are often larger and have a particular tendency to be found extensively and symmetrically in the cerebral and cerebellar white matter, and occasionally in the basal ganglia. Additional assessment of gadolinium enhancement might also help distinguish the disorders: only acute lesions are thought to enhance, and since ADEM is conventionally a monophasic disorder, all identifiable lesions should be of the same age and enhance to the same degree, in contrast to the temporal dissemination of MS. In practice this phenomenon of temporal lesion homogeneity is more commonly reported in children than adults, and temporally heterogeneous lesions at presentation cannot always exclude ADEM. This said, the delineation of two temporally distinct lesion populations does suggest ADEM, rather than the truly heterogeneous lesions of MS (where new lesions, often asymptomatic, occur at a roughly uniform rate). The presence of T1 weighted hypo-intensities, or “black holes”, at presentation on brain MRI is strongly suggestive of a previous destructive inflammatory demyelinating process and therefore MS. (Although theoretically MS patients should not be immune to superimposed ADEM, practically this should not be considered.) Follow up MRI scans in ADEM and MDEM should reveal resolution, partial or complete of old lesions, and no new lesions. As lesions in ADEM can be large and have a mass effect it will occasionally be necessary to biopsy lesions to exclude infective or malignant disease. There is no standard treatment for ADEM. It is a rare disease and no formal clinical trials of any therapeutic agent have been published. Thus the management of the disease rests on strategies that have appropriate effects on the plausible pathogenetic disease mechanisms. As with MS, present treatments rely on immunosuppression and immunomodulation. Since ADEM appears a more purely inflammatory disease than MS (where chronic neurodegeneration and axonal loss are poorly related to the degree of inflammation), such treatments should, intuitively, be more successful in ADEM, and actually affect long term outcome. The main therapeutic options for ADEM are corticosteroids, plasma exchange, and intravenous immunoglobulin (fig 1). β Interferons and glatiramer acetate are not currently used. Suggested treatment flowchart for ADEM. Corticosteroids are widely considered to be an effective first line treatment for ADEM. Intravenous methylprednisolone 1 g daily for at least three days is advised. While expert opinion and several convincing reports support this regimen, the natural history of ADEM of course features spontaneous improvement, and it is difficult therefore to be absolutely certain of its benefits. The recent trend towards improved survival in reported case series of ADEM may, however, reflect increased use of corticosteroids, intravenous methylprednisolone in particular. The rationale for corticosteroid use is their ability to reduce inflammation, decrease oedema, and seal the blood–brain barrier, which should decrease the further influx of active immune cells and humoral factors, contributing to demyelination. 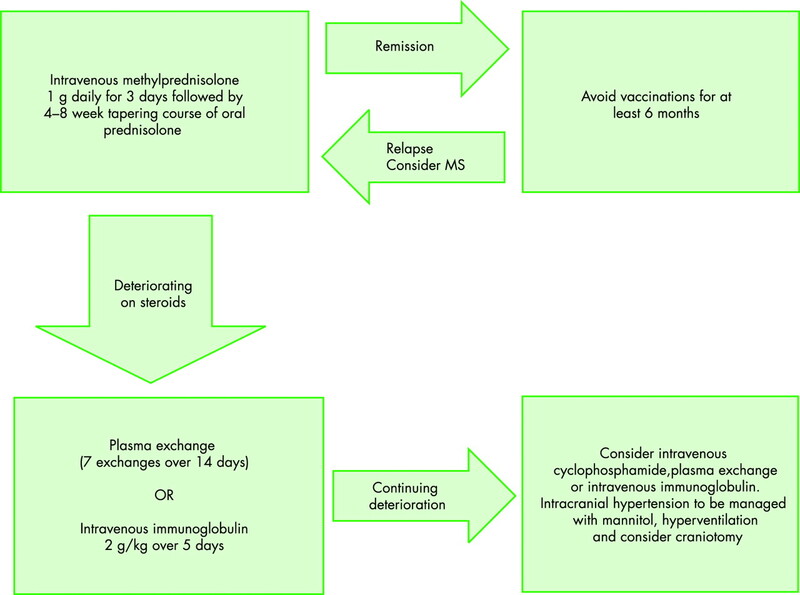 In some cases, cessation of steroid treatment has been followed by a relapse, possibly forming the basis of MDEM. As a relapse suggestive of MDEM is most likely shortly after ADEM it would seem prudent to prescribe a 1–2 month oral prednisolone taper. Plasma exchange is recommended in patients who respond poorly to intravenous corticosteroids. There have also been several reports of impressive responses to plasma exchange; however, some of these have been confounded by the co-administration of corticosteroids and cyclophosphamide. More importantly a randomised, controlled, crossover trial of true versus sham plasma exchange for attacks of severe CNS demyelination resistant to corticosteroid treatment in 22 patients showed that 42% of patients had moderate or greater neurological improvement in the plasma exchange arm compared with just 6% of the patients receiving sham treatment (statistically significant). Although this study only had one patient with ADEM, the other conditions treated under the remit of “severe CNS demyelination”—MS, Marburg variant MS, acute transverse myelitis, neuromyelitis optica—are sufficiently similar and occasionally indistinguishable from ADEM in the acute phase to represent a reasonable rationale for treatment at present. This study used a course of seven plasma exchanges over 14 days, but improvement is frequently observed after the first exchange. Intravenous immunoglobulin (IVIG) has also been used with success in a few cases of ADEM. While the evidence behind its use in ADEM is probably weaker than that of plasma exchange, there are several neuro-inflammatory conditions where IVIG has a proven effect and is often considered a more convenient alternative to plasma exchange. At present it should be reserved for ADEM that fails to respond to corticosteroid treatment and where plasma exchange is contraindicated or impractical. There have been suggestions based on subtle pathogenetic differences that IVIG may be preferable to plasma exchange in cases of post-vaccination encephalomyelitis, but this is not proven. Intravenous cyclophosphamide has also been used in the past with some apparent success but has not gained widespread recommendation. In severe cases of ADEM, and particularly acute haemorrhagic leucoencephalomyelitis, cerebral oedema can occur and should be treated with combinations of mannitol and hyperventilation. If these conservative measures fail then more drastic measures such as craniotomy can be considered. ADEM has been known to relapse into MDEM following routine vaccinations and it would seem sensible to avoid vaccinations (or other immune stimulation) for at least six months following a diagnosis of ADEM. Whatever the precipitant, the histopathological appearances in ADEM subtypes do not differ. There is pronounced perivascular inflammation comprising lymphocytes, plasma cells, and macrophages, with lesions widely disseminated throughout the CNS: a preponderance in white matter is seen, but the grey is not spared, by contrast with MS. In other respects, the degree of similarity with MS varies a little according to different authors. Myelin is lost, but whether this mainly represents primary rather than secondary demyelination is not wholly clear. Areas of necrosis may be found (though some authors would suggest such change indicates a diagnosis of acute haemorrhagic encephalomyelitis rather than ADEM), and the presence of meningeal inflammation may also provide some distinction from MS. An astrocytic response is common to both disorders. The clinical recognition and pathological descriptions of post-vaccination encephalomyelitis in the 1920s and 1930s triggered the first experiments in which animal models of inflammatory demyelination were described. Monkeys were inoculated with brain extracts and found to develop ataxia and weakness. Pathologically, perivascular inflammation and demyelination were found, and similarities between what became known as experimental allergic encephalomyelitis and post-vaccination encephalomyelitis—the disorder upon which it was directly modelled—were immediately apparent. While some studies have suggested similarities at the histopathological level with MS, generally the pathology of EAE has maintained and emphasised a greater resemblance with ADEM than MS—not surprisingly, considering the mode of induction—and have continued (notwithstanding changes in species of experimental animal and method of inducing disease) so to do. It has, however, remained the case that EAE is most commonly perceived and studied as a model of MS rather than of ADEM. Although animal models with greater clinical similarities with MS than acute EAE have emerged, history may come to judge EAE as a relatively time consuming, though possibly necessary, diversion on the path to a better understanding of MS. The close parallels between ADEM and EAE, and the common use in rodent models of myelin basic protein (MBP) as the encephalitogenic inoculum, stimulated investigations seeking MBP reactivity in ADEM patients. In general terms, a more compelling case implicating anti-MBP responses can be assembled in ADEM than in MS—as might be predicted by the pathological relationships. Thus, in one important study, 57 T cell clones were isolated and analysed from plaques, and several hundred from CSF samples, from patients with inflammatory demyelination. In those from patients with MS, none was identified that was specific for either of the major myelin proteins MBP or PLP; in contrast clones with reactivity against MBP were found in five out of nine CSF samples from patients with ADEM. Similarly, peripheral blood reactivity to MBP is more striking and consistent in patients with post-infectious ADEM than those with MS, and disappears with clinical recovery. A possible contribution from humoral mechanisms is suggested by the probable response to plasma exchange and also the finding of serum antibodies directed against MBP and galactocerebroside in patients with post-rabies inoculation ADEM; intrathecal synthesis of these antibodies was also convincingly demonstrated. In studies of post-infectious ADEM, however, no serum antibodies against MBP were found. In summary, it appears likely that parallel B and T cell mediated reactions are responsible for generating CNS inflammatory damage in ADEM. Establishing the relative primacy of humoral and cellular immune responses may be as difficult as it is inconsequential, at least unless and until specific anti-T and anti-B cell immunotherapies should be developed. In the case of post-infectious ADEM, molecular mimicry between virus and myelin antigens may be responsible for initiating disease—as suggested with the more hypothetical viral connection in MS. Sequences of myelin proteins which have significant homologies with incriminated viruses are described. For many years after the original descriptions of post-infectious encephalomyelitis, the question of whether this was an “allergic” reaction or a direct (but delayed) CNS invasion by the infecting pathogen remained contentious (and studies apparently but not surprisingly demonstrating “infectivity” of affected CNS material naturally did little to resolve the issue). A more complicated residual question of whether CNS invasion at some time in the course of infection was a necessary precipitant of ADEM has only more recently been answered, careful studies confirming the absence of viral invasion of the CNS in post-measles ADEM. Thus, simple systemic infection in susceptible individuals appears sufficient for the development of ADEM. In the case of post-vaccinal ADEM involving CNS derived tissue, the causes of myelin directed immune reactivity are rather more transparent. Wingerchuk DM. Postinfectious encephalomyelitis. Current Neurology and Neuroscience Reports2003;3:256–64. ▸ A well written up to date review of postinfectious encephalomyelitis. Tselis A. Acute disseminated encephalomyelitis. Current Treatment Options in Neurology2001;3:537–42. ▸ A concise review of treatments for ADEM and their evidence base. Stuve O, Zamvil SS. Pathogenesis, diagnosis, and treatment of acute disseminated encephalomyelitis. Curr Opin Neurol1999;12:395–401. ▸ Current five years ago but still a useful reference for the reader seeking a wider viewpoint of the disease. Scolding N, Mottershead J. The differential diagnosis of multiple sclerosis. J Neurol Neurosurg Psychiatry2001;71 (suppl 2) :ii9–15. ▸ A readable and practical guide to differentiating multiple sclerosis from its many mimickers, including ADEM. Scolding N. Immunological and inflammatory disorders of the central nervous system. Butterworth Heinemann, 1999. ▸ Workaday and middling if unoriginal. Dale RC, de Sousa C, Chong WK, et al. Acute disseminated encephalomyelitis, multiphasic disseminated encephalomyelitis and multiple sclerosis in children. Brain 2000;123:2407–22. ▸ An excellent local study of 48 children with inflammatory demyelination of the CNS. Tenembaum S, Chamoles N, Fejerman N. Acute disseminated encephalomyelitis. A long term follow-up study of 84 paediatric patients. Neurology2002;59:1224–31. ▸ A larger, less local study of ADEM in children. Schwarz S, Mohr A, Knauth M, et al. Acute disseminated encephalomyelitis. A follow up study of 40 adult patients. Neurology 2001;56:1313–8. ▸ A large contemporary study of ADEM in adults. Miravalle A, Roos KL. Encephalitis complicating smallpox vaccination. Arch Neurol2003;60:925–8. ▸ In the event of widespread smallpox vaccination this very readable article may be considered a fact based alternative to the popular press.